Sneaking Duck founder Mark Capps tries out a pair of 3D-printed frames. 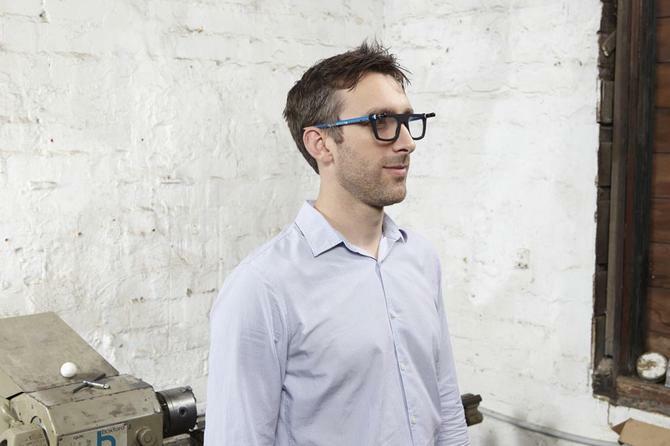 Sydney startup Sneaking Duck has announced it will personalise glasses frames for customers by using 3D printing. The e-commerce website launched the 3D printing service today. To do the actual printing, Sneaking Duck has partnered with industrial engineer Andrew Simpson at Vert Design. Why get frames 3D printed? Sneaking Duck claims the frames can be custom-fitted to the customer’s face while including the same quality lens as ordinary frames. 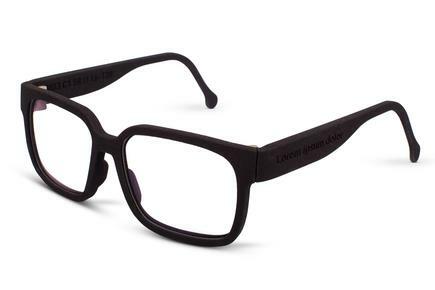 The $360 frames are made from nylon using a technique called selective laser sintering (SLS), which uses a laser to meld a powdered material into a solid structure. The material is lighter and more flexible than acetate, the plastic material typically used in frames. The nylon material also shows wear and tear more than acetate, but Sneaking Duck claims that’s a feature. “For instance, they'll fade in the sun and their rugged, sandy texture will smooth over time,” according to the Sneaking Duck website. Customers choose from four base designs created by Simpson and then six colours: black, white, royal blue, violet purple, coral red and hot pink. Customers can then choose the arm length and optionally add text (17 characters) to the outside left arm. The frames can be fitted with prescription lenses and shades. The frames are printed in the USA and take five weeks for free delivery to Australia. The frames come with a six-month warranty covering manufacturing but Sneaking Duck doesn’t allow replacements or refunds for any other reason. The Archer base design with a custom message on the left arm. Sneaking Duck had been looking at 3D printing since it launched its Web store two years ago, Sneaking Duck founder and CEO Mark Capps said. However, at the time it was too expensive to get the quality of 3D printing that Sneaking Duck wanted. "We didn't want this to be a gimmick. Many people will have seen those sort of extremely plastic 3D prints. Nothing wrong with them, but they're probably not a product you'd want to wear on your face every day." On-demand printing also saves Sneaking Duck money, he said. "It means that you only make what you need," he said. "We do our best to manage our stock, but you always end up with a few pairs that either get damaged or bashed, or you just don't sell all the ones you stock." Capps said Sneaking Duck plans to expand the options for its 3D-printed glasses in the future. "If we find people are responding well to it, we'll keep expanding both the range of designs and the ability to customise." For example, Sneaking Duck is currently experimenting with letting customers adjust the width of frames across the front, he said. "Technically it's a bit harder because you can't just stretch the design. You have to know where to put the extra distance in, whereas with the [frame] arms it's pretty easy." The price is also likely to come down as the costs of 3D printing continue to fall, he said. When the price of 3D printing drops to the point where people can buy them for their homes, Capps imagines a business where it's just a one-time-use frames design that is sold, and the customers do the actual printing themselves. While that’s not an affordable proposition for consumers today, "things can change and things can change fast," said Capps. He pointed to the rate of improvement in paper printers. "I can print at home now pretty much as well as commercial printers could print ten years ago." While Sneaking Duck is unlikely to convert its business completely to 3D printing sales, Capps said it will play a significant part. "We think it's a huge opportunity." Sneaking Duck is the sister site of another Sydney startup, Shoes of Prey, which sells customised footwear for women. Shoes of Prey recently revealed plans to mix Leap Motion with circus wizardry to create interactive 3D hologram previews of its products.